The 11:11 phenomenon refers the synchronicity involving the number sequence 1111, or seeing 11:11 reoccuring in your day to day life. Other repeating number sequences also tend to pop up out of the blue. Those who report experiencing the 11:11 phenomenon often feel as if there is some significant meaning to seeing the numbers in such a synchronistic way. These individuals often have a lot of unusual things in common with one another. In Numerology, the Number 11 is considered a Master Number. Learn More About the 11:11 Synchronicity, Numerology and Read 11:11 Experiences from around the world. 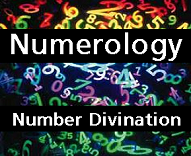 Videos and information about Numerology and the divination of numbers. Each number has a specific vibrational frequency and numbers play a role in our personality and our personal lives. Videos and information about various methods of Divination including Tarot Cards, Runes, Astrology, Numerology, and more. Videos and information about the the various dimensions and planes of reality, parallel timelines and states of consciousness.